If you haven't treated your teeth to a brushing with Philips Sonicare power toothbrush, what have you been waiting for? Forget all that manual back-and-forthing. One of these brushes removes plaque, whitens teeth and promotes healthier gums in just one brushing session. 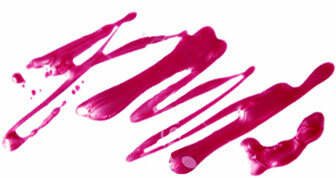 With 31,000 brush strokes per minute (try beating that with your bare hands! ), the brand's latest sonic-tech toothbrush is a dental dream. Just one session with this gadget removes seven times more plaque than a manual toothbrush. Are you grinning yet? The Philips Sonicare FlexCare Platinum toothbrush is the brand's most innovative sonic brushing system to date. Every bristle in the InterCare Brush Head is has a special job to do. Yep, each bristle is specifically made to perform specific tasks: light green ones remove plaque between teeth, dark green ones brush away plaque along the gum line, and white ones polish and clean the surface of teeth. Plus, there are blue "reminder" bristles that fade when it's time to replace your brush head. That's not all. Ever wondered what a shiatsu massage would feel like on your gums? The toothbrush features a customized brushing system that allows you to create your own personal cleaning regimen - including massage. After all, not all mouths were created equal. You have the option of three intensity level settings (low for sensitive areas, medium and high) and three brushing modes: Clean for powerful plaque removal, White for two minutes of extreme whitening, brightening and polishing, and GumCare for two minutes of Clean mode and one minute of a gentle gum massage. But wait, it gets better. A Pressure Sensor immediately alerts you when you're brushing too hard. And if you're worried about germs, the FlexCare Platinum comes with an optional UV sanitizer to kill 99% of bacteria and viruses. It has a three-week battery life for easy travel. 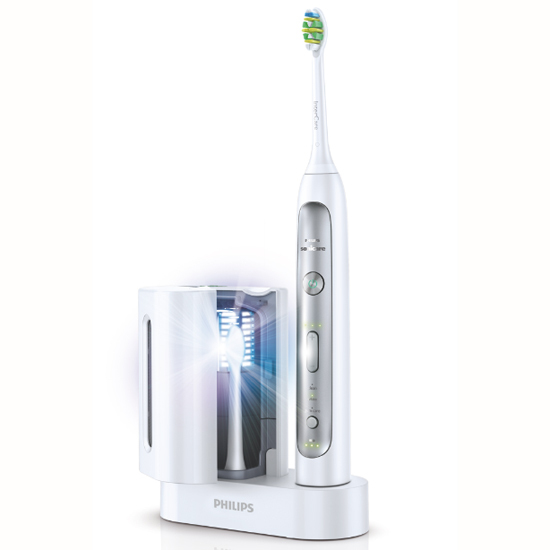 The Philips Sonicare FlexCare Platinum toothbrush is available for pre-order on Amazon.com now and will be available in mid-July for $179.99-$199.99 at usa.philips.com.